College graduation is a time for celebration. As you enter a new phase in your life, remember these money tips for graduates to help you create a strong foundation for financial success. Chances are, you have already used debt in some capacity. The average student loan payment for a borrower is over $350. Among young adults with at least a bachelor’s degree, over 50% have student loans. You may be among this group. Like financing college, most Americans rely on access to loans to finance homes, cars and other large purchases. The question is- is this good debt, or bad debt? Good debt is used to invest in something that will generate income for you over time. Good debt adds money to your Income Statement. Bad debt does just the opposite- it costs you money by creating a monthly expense with no offsetting financial benefit. One of the most important money tips for graduates that I can offer is to avoid using bad debt as you start to create the life you desire. If you have specific financial goals or just want to start your post college life on a good financial foot, being realistic about your financial habits is essential. Many people set goals or say they want to make positive financial choices. Unfortunately, those same people often don’t look at the measurable information available to see where they can make adjustments or improvements. This money tip for graduates is about exploring what will work for you. A tool does you no good if you don’t use it. Find a way to track your spending using a phone app or a service offered by your bank, so you can make informed decisions about what you need and how you will pay for what you want without using bad debt. Do you make plans when going out with friends? Do you plan time to see your family? What about planning time to catch your favorite show? We prioritize our time, tasks and activities based on what is most important to us. If being financially healthy is important to you, you should also be planning your spending. Any list of money tips for graduates would need to address budgeting. Here it is…but under different vocabulary. Having a Spending Plan prioritizes your hard-earned dollars, just like you would prioritize your precious time. This doesn’t mean you are planning on spending ALL of your money. A spending plan gives you a guide to follow so that you keep your spending focused only in the areas you want your money to go. Part of this plan should include saving (an emergency fund) as well as allocating funds to investing in other types of assets. My list of money tips for graduates would not be complete without addressing credit. Your credit score is a tool to help you save money and qualify for better rates on insurance and other services. But if you don’t protect and guard your credit score, it will be a liability that makes borrowing more expensive and disparages your personal credibility. In some cases, your credit score could be the difference between getting a job or being passed up for a different candidate. Be informed on your personal credit score and what is on your credit report. You are entitled to one free credit report from each of the reporting agencies each year (and more often under certain circumstances). If you review your report and find errors- report those errors and ask them to be corrected. When it comes to relationships, money can be a touchy subject. If you are currently in or are considering entering into a committed long term relationship, plan to have the money talk. This conversation should include your short term financial priorities as well as your long term goals. Start by talking about what your parents said about money. This is where your financial programming started and will help you discover your overall philosophy about money. Once you have identified your money mindset, you will also be aware of whether you are on the same financial page or need to bridge a bit of a gap in your financial mindests. You worked hard to get through college. You have a bright future in front of you. Financial decisions will either amplify this brightness or dull it. 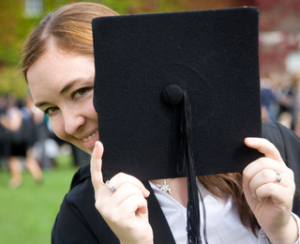 Use these money tips for graduates to establish positive financial habits. For more specific financial tips and stories, visit www.sharonlechter.com/freegift to receive a complimentary copy of my You and Your Money ebook.